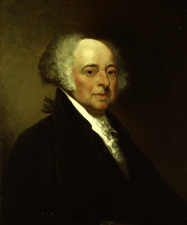 ADAMS, John, (father of John Quincy Adams; grandfather of Charles Francis Adams; cousin of Samuel Adams; father-in-law of William Stephens Smith), a Delegate from Massachusetts and a Vice President and 2d President of the United States; born in Braintree, Mass., October 19, 1735; graduated from Harvard College in 1755; studied law; admitted to the bar in 1758 and commenced practice in Suffolk County; joined the Sons of Liberty and argued against the Stamp Act; was elected to represent Boston in the general court in 1768; Member of the Continental Congress 1774-1777; signed the Declaration of Independence and proposed George Washington, of Virginia, for General of the American Army; became a member of the Board of War, but resigned to accept appointment as commissioner to the Court of France; Minister Plenipotentiary to Holland 1782; first Minister to England 1785-1788; elected in 1788 as the first Vice President of the United States with George Washington as President; reelected in 1792 and served from April 21, 1789, to March 3, 1797; elected President of the United States and served from March 4, 1797, to March 3, 1801; delegate to the constitutional convention of Massachusetts 1820; died in Quincy, Mass., July 4, 1826; interment under the old First Congregational Church, now called the United First Parish Church. McCullough, David. John Adams. New York: Simon & Schuster, 2001; Ryerson, Richard Alan, ed. John Adams and the Founding of the Republic. Boston: Massachusetts Historical Society (Northeastern University Press), 2001.